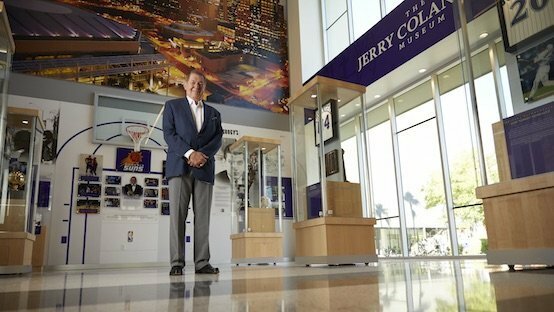 GCU has opened the 2,200-square-foot Jerry Colangelo Museum to honor an outstanding servant leader who cemented himself in Arizona’s sports and business history. An American sports and business icon will be honored with a museum that bears his name. Grand Canyon University has opened the Jerry Colangelo Museum on its burgeoning west Phoenix campus to tell the story of a leader who has cemented himself in Arizona’s sports and business history, while becoming one of the most influential figures in all of professional sports. The 2,200-square-foot museum, designed by the company that created the Peyton Manning Room at University of Tennessee, features six panoramic sections that trace Colangelo’s professional life and accomplishments — from his early years with the Chicago Bulls to his highly successful management of the Phoenix Suns, Arizona Diamondbacks and USA Basketball. An area of the museum called “Doing Business God’s Way” recounts his civic and philanthropic endeavors and highlights “faith, family, friends and community,” which has been his mantra in life. Complementing stories, news clips, artifacts and photos are some of Colangelo’s memorabilia, including his Arizona Diamondbacks World Championship ring, Coach John Wooden’s “Keys to Life” Award, the NCAA Naismith Award, NBA Executive of the Year Awards, Basketball Hall of Fame trophy, USA Basketball Olympic gold medals, jerseys from Phoenix Suns and Arizona Diamondbacks, and more. Colangelo is largely responsible for making Phoenix a four-sport city and turning the city’s downtown into an epicenter for business and entertainment. He led one of the most successful franchises in the NBA with the Suns, brought the Phoenix metropolitan area its first world championship with the 2001 Diamondbacks, was instrumental in the relocation of the NHL’s Winnipeg Jets to become the Phoenix Coyotes, was a founding member of the WNBA, brought Arena Football League and indoor soccer teams to Phoenix, and revived USA Basketball with three consecutive gold medals. Colangelo first became involved with GCU in 2009 as a board member. Since then, he has taken on the name of the Colangelo School of Sports Business, serves as a consultant in GCU’s transition to NCAA Division I athletics and paved the way for the hiring of Dan Majerle as men’s basketball coach. In 2014 the entire Colangelo College of Business was named in his honor to embody Colangelo’s vision of not only developing academic excellence and real-world relevance within its graduates, but also producing values-driven business leaders who make a difference in the world. “I am humbled by what GCU chose to do with the museum and how they did it,” Colangelo said. “This is world class. Everything Brian Mueller has done here is first class. Colangelo, 77, has a long and storied career. A member of the Naismith Basketball Hall of Fame, Colangelo became the youngest general manager in professional sports when he joined the Suns in 1968. He transformed the expansion team into one of the most successful organizations in the NBA before selling the franchise, along with the WNBA Phoenix Mercury and Arena Football League’s Arizona Rattlers, in 2004. During his tenure with the Suns, he was a dominant force in helping the NBA reach new heights. In addition, he changed the face of the Phoenix skyline with two state-of-the-art sports facilities. Colangelo led the efforts to bring Major League Baseball to the Valley in 1998 and was chairman when the Arizona Diamondbacks clinched the World Series title in 2001 in just their fourth year of existence – the fastest ever for an MLB expansion team. He is a principal of JDM Partners, a real estate development company, and an active community leader who has championed numerous causes rooted in business, education and family. A man of deep faith, he holds steadfast in his belief to trust in God, who he believes will help lead people to the best opportunities to make the most significant impact on humanity.